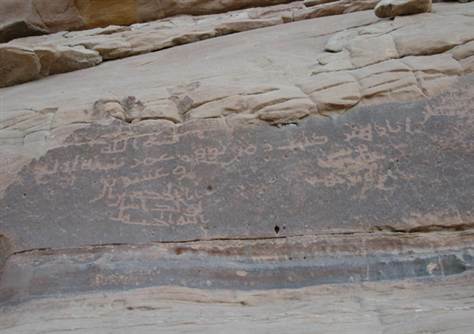 Here is a picture of what is considered (to date) the oldest dated Islamic inscription, from 24H, when the Rightly Guided Caliph ‘Umar b. Al-Khattāb – Allāh be pleased with him – was assassinated. It is located at Al-‘Ulā in present day Saudi Arabia. It is one of a number of ‘graffiti’ inscriptions made by travelers and pilgrims from the first few centuries of Islām. Note: The discoverers and local experts say the script is Hijāzī, not Kufic. Verily, the followers of opinion are the enemies of the Sunan (the teachings of Allāh’s Messenger as passed down in hadith): they were unable to preserve them and their meanings escaped them, and when asked [questions] they were too embarrassed to say ‘We don’t know,’ so they opposed the Sunan with their opinions. Ibn Abī Zamanīn, Uṣūl Al-Sunnah article 8; Al-Lālakā`ī, Sharḥ Uṣūl I’tiqād Ahl Al-Sunnah article 201 et al. I have considered sending out men to the different regions to check on all those who are well off enough but have not made Hajj, and impose the jizyah (tax imposed on Ahl Al-Kitāb in the Muslim state) on them; they are not Muslims, they are not Muslims. If the people abandoned Hajj, we would fight them for it as we fight them for the prayer and zakāh. Whoever dies, being well off enough but having never done Hajj, let him die as a Jew if he wishes or as a Christian. If you died and had never made Hajj, I would not pray over you. If a neighbor of mine died without ever making Hajj, while being well off enough to do so, I would not pray over him. Al-Khallāl, Al-Sunnah 5:43-47, articles 1572-1576.